The City Planning Commission’s 6-2 vote in favor of the proposed Costco on South Carrollton wasn’t for any lack of support for the project. In fact, the two dissenting votes were from members who said the city’s recommendations don’t support Costco enough. The big-box wholesale club was up for a design review before the City Planning Commission meeting Tuesday, an administrative hearing that does not include public comment and didn’t appear late that afternoon to retain any audience at all from the huge crowd there for the Tulane stadium debate. Commissioner Lou Volz asked the city planning staff for a review of the unresolved design issues with Costco, prompting a discussion that showed the minutiae that officials delve into as part of consideration of a project of Costco’s 150,000-square-foot magnitude (live coverage available for review at the end of the Tulane article). On the walls, for example, the city has questions about the steel paneling proposed, and it wants to see more recesses and indention in the wall design, to break up the visual effect of a long blank wall, plus more trellis-type features along it. They also want more pedestrian walkways through the parking lot. More significantly, city officials want to limit the development to about 500 parking spaces, rather than the 670 Costco currently proposes. 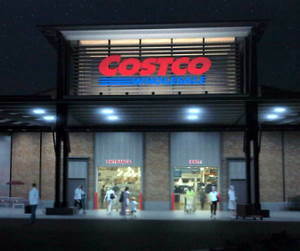 Costco store designer Ted Johnson had answers for each of those issues. The steel paneling is new, energy-efficient material that dramatically reduces energy costs in the store, he said, and they’ve added more texture to the facade. They don’t want the plants in front that the city recommends because it will interfere with the foot traffic of shoppers pushing the large Costco carts. On the parking lot, Johnson said they intentionally build the parking spaces larger than most, with double lines between them to give shoppers more room to maneuver large bulk purchases, which creates more room for pedestrians to walk safely. But they need the larger number of spaces, he said, because shoppers typically stay up to an hour, compared to more like 20 minutes for a grocery store visit. Some Costco stores have more than 1,000 parking spaces, Johnson said. “We need that type of parking because the shopping pattern at a Costco is much different from a Wal-Mart or a grocery store,” Johnson told the commissioners. Volz, however, was more cautious, and said he preferred to leave the requirements in for the store and the City Council to work out. His motion passed, 6-2, with Mitchell and commissioner Kelly Brown voting no — both saying they were voting against the requirements, not against Costco at all. The city’s proposal to rebate $3.3 million in sales taxes to Costco to pay for federally required flood-elevation remediation, described Monday by Frank Donze of The Times-Picayune, was not discussed by the commission, but could reportedly be introduced as early as the City Council’s June 28 meeting. I do not understand what this city has against parking, Costco wants to put in 750 spots and the city wants them to scale it back to 600. Costco take a look at what happened to Whole foods uptown, they are constantly dealing with parking issues and the neighbors. The block behind them was an entire parking lot and they turned it into houses. It’s really odd, frankly. Sometimes the city encourages off-street parking (as with minimum parking requirements) and sometimes it fights it. There’s really not a very consistent policy. It would be nice if it at least yielded good results, but in the end it always seems like nobody’s happy.